It only took 8 days. Day 1: “Hey, did you get that Facebook message I sent you yesterday?” my sister-in-law asked me as we finished breakfast. “No, when did you send it?” I replied. “Yesterday afternoon. I saw this post on our town’s Facebook page saying that they’re looking for host families for high school foreign exchange students. I read it and immediately thought of you!” she told me. My thoughts instantly went back to the year and a half when I lived in Europe. Ever since we returned to our hometown in Tennessee, my husband and I have tried to share those experiences with our families. We cooked foreign cuisine with our parents, read Italian books to our nieces and nephews, created photo books to show our siblings where we went, and fondly told stories of the people we met and the places we visited. After breakfast with my sister-in-law, I returned home with my thoughts wandering with possibilities of hosting a student from Europe. I couldn’t wait to ask my husband about the idea. See, my sweet husband is wise, thoughtful, and analytical; he takes time making decisions. After much research and prayer, he comes to the most wise and logical conclusion. That afternoon I contacted the organization and we began the process of filling out forms, creating a profile and meeting our local coordinator. That was on April 22. Days 2-7: The following week we began to look at student profiles. We decided to host a teenage girl from Italy. We preferred a female since I work from home and would spend more time with the student. And we wanted a student Italy since we lived there for 6 months and my family heritage is Italian. Day 8: On April 30, we were approved for the student we selected! She arrived in Nashville on July 29. Hosting her has been one of the best things we have done! For us, the decision was easy. We love European cultures, peoples, languages, and cuisine. We lived in Europe for 18 months and we missed it (still do!). We wanted our families to benefit from a foreigner being invited into the everyday stuff of life. I work with teenagers in our youth group and I adore that age group! I remember being a teen and wishing I had someone (other than my parents) to talk to. I remember how I looked up to the college-aged girls and wanted to be like them. Basically, I love teenagers. We had also been praying for the lord to prepare our hearts for parenthood. Fostering didn’t make sense for a variety of reasons. But hosting a high school student from another culture was a perfect fit! We have a spare bedroom and bathroom in our house. We both work flexible jobs and could be around before/after school. We have been wanting to be a tourist in our own hometown. If we had a foreigner living with us, we’d be able to do those touristy things! 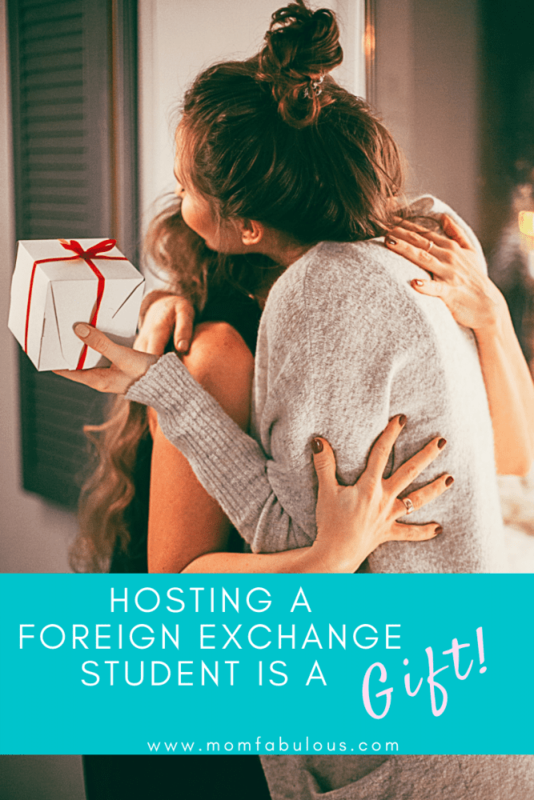 Ultimately, we believed that hosting an student from another country would be a gift. It would bless the student with the opportunity to live in America, become even more fluent in English, experience the American way of life, and to be loved by another family. And without a doubt we foresaw that the student would become a member of our family, an adopted child, and would forever hold a special place in our hearts. Although our student has only been with us for 5 weeks, we already call her our daughter and are saddened by the thought that she will one day go back home! She is truly a gift. Are you interested to host a high school foreign exchange student? Do you have a margin of time in your current schedule? Does your home, car and family have the capacity to add another member? Do you have a curiosity about other countries and cultures? Do you desire to learn another language? Do you want to help your children have a broader perspective on life? If you answered “yes!” to at least 3 of those questions, then you would probably be a wonderful host family for a high school foreign exchange student! Do you have a spare bedroom? Many agencies require that the student has their own personal bedroom. Often the bathroom can be shared. With your current work schedule, would you be able to help a foreigner have a typical American family experience? Could you eat a family meal together most nights of the week? Are you able to do touristy things in your area, or to take a vacation? Could you take a student to/from sports practice or after-school clubs? Would your extended family be welcoming to a foreigner? Can you financially afford to feed another person, pay additional utility bills, and cover the expenses of extra gas (assuming you drive the student to/from school, activities, sports, etc.)? Does your local high school accept foreign exchange students? We are currently hosting through Greenheart Exchange and highly recommend them! But you can learn more information and discover local hosting agencies through the United States Bureau of Educational and Cultural Affairs.